Have you tired of typing "Hey, I'm looking for a ... parts of the ... set with traits..., please let me know if you will got some" every time when you entering a dungeon with new group? Have you tired retyping this exact words every time when final boss falls? Have you ever tired of scrolling your chat, while looking who and what has got? Well, this addon is for you then! It checks your group loot and let you know if someone got needed for you item! Yes, you need to setup your filters first, but only once. And this filters are account wide! Then, in the game, go to Keybind settings and set desired button for this addon. 1 - Type your 1st keyword here and press "+" or Enter. What can be a filter word? A part of the item name or set name. "The" and "set" are not parts of the set names, btw! Then you will see your 1st filter. What does this fields mean? 2 - check this to filter loot only by keyword. All other filters for this keyword would be ignored. 3 - your keyword here. You can change it at any moment. 4 - press this button to find this keyword, using Inventory Insight. Sure, you must have that addon installed. 5 - your offer in case if you are ready to pay money to the item owner. Feel free to change it. 7 - this button allows you to delete filter for that keyword. This action can not be reverted, so take care! 8 - Armor weight filter. Check none or all to look for any armor types. Or check just specific types. This filter mostly not needed, but useful for monsters helmets chase. 9, 11 and 6 - armor, weapon and jewelry parts. Check none to not look for it completely or check all to look for any parts. Or check just specific parts. 10, 12 and 13 - armor, weapon and jewelry traits. Check none or all to look for any traits. Or check just specific types. That means, someone (you included) got an item with matched filters. Go to cursor mode and press this icon or just press previously bind button. 1 - Beg. You will ask an owner to spare this item to you. Meaning - for free. Both messages would be posted into the group chat (if owner in the same group with you) or in private. This log would persists with you even after relog, so noone would be able to hide your precious from you! And that's it, fast and simple. Armor, weapon and jewelry with CP level lower than 160 would be ignored. This is not optional. Works good at Eng client. In theory, loot filtering must work in any other languages too, but this is not guaranteed. And chat messages still would be in english. Also, addon UI is in english either. i just deleted and reinstalled begging the gear ver 1.9.6. 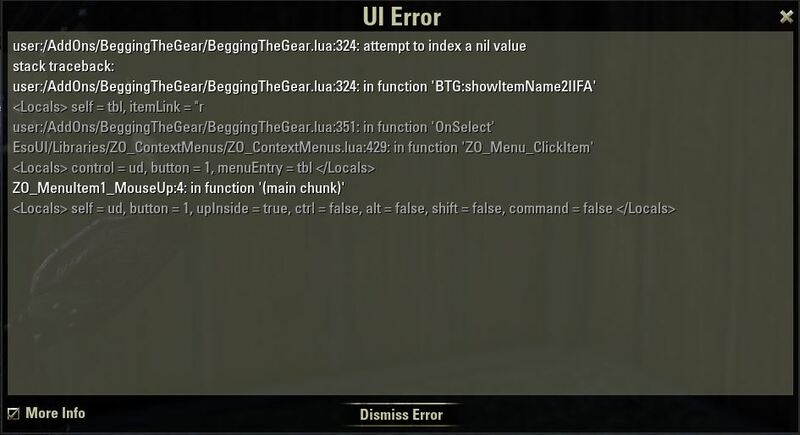 I unticked all my other addons and just had begging the gear and Inventory Insight and this is the error i'm getting. not sure if i'm doing something else wrong? hi, i'm getting a this error messege while useing Inventory Insight menu BTG-Check IIFA, any idea? hiya, sorry but i'm still getting the same UI Error after fix. Hi. I went back and read the old comment. I agree with Majeure. It's your add-on so you can design it however you like BUT I still feel that whisper should be default behavior, there are too many messages at the end of a raid in Group chat already. 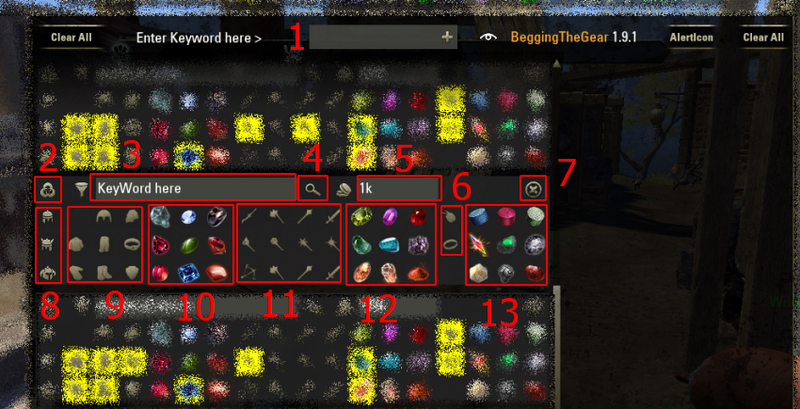 People saying "Thanks", manually asking for gear and others linking ALL the gear they are willing to give away - my BTG message is lost in all the other messages. A whisper grabs the attention of the person I want to talk to and doesn't flood everyone else's chat. Additionally, by publicly announcing that a player got a piece of gear I create competition that would not have existed otherwise. As I said in my last comment I have had people straight up steal gear I publicly asked for as they confuse the person who got the drop by opening trade with them first even though I asked them for the gear or it forces them to pick between many group members who all want that gear now that I have made others aware it exists. I do not believe they need the gear or were looking for it specifically, people just see it is a good trait and think "I might use that someday". Your add-on assumes people are all nice to each other, they are not. If two people whisper for same gear the person who got the gear can simply say "Sorry, someone else whispered first." - simple and straightforward. To be clear this add-on is for random groups of strangers. If you are running with your guild and they are nice people, this is not an issue nor is this addon required. XD , i will think about this "again"
Last edited by derat : 03/03/19 at 02:26 PM. Last edited by mr_red : 02/27/19 at 05:52 AM. I really appreciate your add-on, it's really handy for tracking all the ideal pieces needed for multiple toons - but can we please have the option to whisper instead of announce to the raid/group. I have had on multiple occasions used beg, and suddenly five other people in the raid also "need" that same item. No one asked beforehand but now that I have pointed out a perfectly traited item has dropped everyone decides they need it. I have lost out in that scenario more than once OR I'll ask via beg/offer, the guy will say "ya sure" but someone else will just open trade with him faster than me - he/she doesn't check the name and gives it away and the random just drops group loot "stolen". Even if all the addon does is open a whisper to them and I need to type. Something less public. Please. Also, just Divines trait search wouldn't work - you need to check needed item types. Or all armor types if you need all of them. I think it did work before. I've never got notification about well-fitted when I was looking for Divines and I had set it up. What's the point to set up traits then if it shows them all regardless of the trait. But I will have a look at it as you mentioned. Also have to agree, would love to just the whisper option even if we are grouped and an option to change the text. Probably can change in a file but still. Last edited by syzgod : 10/30/18 at 06:43 PM. That's what "Check loot by Keyword only" means! Now that you connected the dot(s) it makes perfect sense but out of context I didn't get it. Thanks! I did have gloves and divines selected. Just missed the one button, I'm sure that was the reason. Last edited by SilverWF : 10/30/18 at 06:12 PM. I'm a bit confused. I set up the filter to search for Olorime gloves with a Divine trait. I got notifications for everything Olorime, Greatswords, Gloves with well-fitted, sashes etc... So the word filter is working but it seems the other filters are ignored. Is it something I am missing... a setting to say only show me things that match all filters or is it broken? I wish there was an option to just whisper, pugs often do not read all the Group text at the end of a trial additionally being able to customize the text would be great. But seems like a great add on - just some thoughts if you are looking to make additional changes. Last edited by derat : 10/30/18 at 06:35 PM.